Audi provides a glimpse of the future shape of design, along with automotive and drive concepts, through its Audi crosslane coupé concept car. This vehicle is an entirely new fusion of technology, engineering and design, and provides pointers to the design language of Audi’s future Q models. 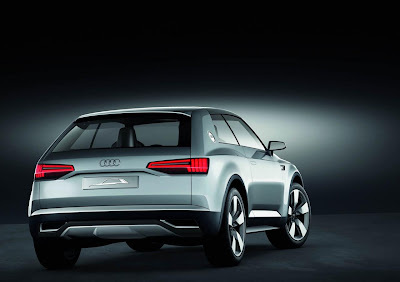 With a Multimaterial Space Frame, the vehicle concept strikes out along entirely new paths with regard to weight, costs and energy usage over its lifecycle, and is an evolutionary stage of Audi ultra – the lightweight construction principle from Audi. An innovative and efficient plug-in hybrid drive based on a purpose-designed 1.5-liter three-cylinder TFSI and two electric motors redefines the benchmark, with fuel consumption of only 1.1 liters per 100 km (213.81 US mpg) and CO2 emissions of just 26 grams per km (41.84 grams per mile). 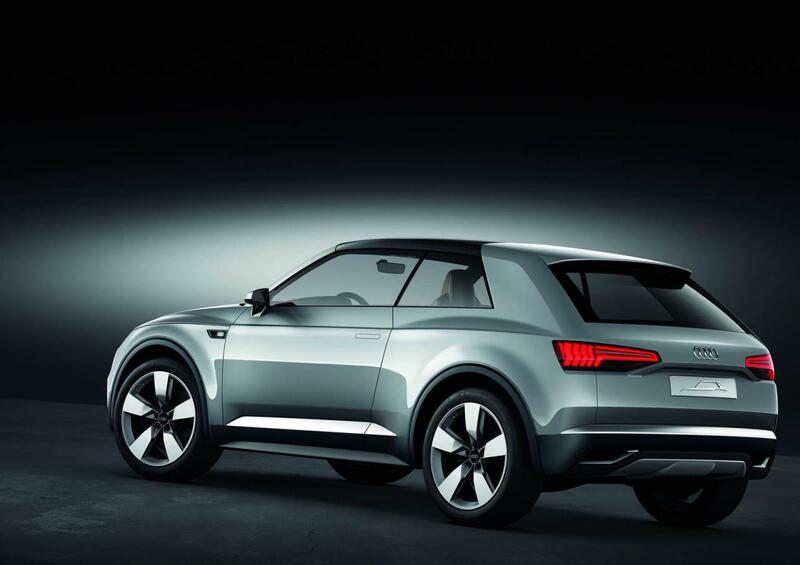 The result is a cosmopolitan vehicle that will appeal to young, sporty customers in particular thanks to its removable roof and the customizable services available under the Audi connect concept. The Multimaterial Space Frame of the compact Audi crosslane coupé is comprised of three materials – aluminum, carbon fiber-reinforced polymer (CFRP), and glass fiber-reinforced polymer (GFRP). The concept car has an unladen weight of about 1,390 kg (3,064.43 lb), including the large lithium-ion battery. The aluminum profiles form a continuous, rigid structure around the occupant cell. Beams beneath the front lid join the single-frame grille, which performs a supporting function and is also made from aluminum, with the occupant cell. The front and rear crash structures are made from CFRP and the supporting CFRP structures inside the occupant cell include the inner sills, the center tunnel, the bulkhead, and the cross-members in the floor. Surface GFRP components with partial CFRP reinforcements complete the body concept. Audi is convinced that the highly integrated Multimaterial Space Frame is the right path to the future. Its weight is of the same magnitude as a monolithic body of CFRP. It also offers convincing advantages in terms of costs to the customer and its energy usage in a life cycle assessment. The plug-in hybrid drive of the Audi crosslane coupé, which is described as a dual-mode hybrid, is as innovative as it is efficient. It comprises a combustion engine, two electric motors and a single-stage transmission; its system power is 130 kW (177 hp). The Audi crosslane coupé sprints from zero to 100 km/h (62.14 mph) in 8.6 seconds, and in pure electric mode takes 9.8 seconds. The car’s top speed is 182 km/h (113.09 mph). Its average fuel consumption is a mere 1.1 liters per 100 km (213.81 US mpg) and it emits 26 grams per km (41.84 grams per mile) of CO2. The lithium-ion battery has an output of 17.4 kWh, sufficient for an operating range of around 86 km (53.44 miles) in the electric mode. The combustion engine is a purpose-developed three-cylinder TFSI with a displacement of 1.5 liters, delivering an output of 95 kW (130 hp) and 200 Nm (147.51 lb-ft) of torque. The three-cylinder engine is coupled to an electric motor (EM 1), which acts primarily as a starter and an alternator. It develops an output of 50 kW (68 hp) and 210 Nm (154.89 lb-ft) of torque. Electrical traction is provided by the second electric motor (EM 2) developing 85 kW (116 hp) and 250 Nm (184.39 lb-ft) of torque. The transmission makes it possible to connect the combustion engine complete with alternator to the remainder of the drivetrain by means of a claw clutch. The dual-mode hybrid concept enables different operating modes. From 0 up to 55 km/h (34.18 mph), drive power is supplied solely by the EM 2, which draws the energy it needs primarily from the battery. In serial mode, the combustion engine and the alternator (EM 1) produce electrical energy to support, relieve or substitute the battery should it be discharged. The electric mode is possible up to 130 km/h (80.78 mph). Starting at about 55 km/h (34.18 mph) the drive system allows the TFSI engine together with the alternator to couple to the drivetrain – in this hybrid mode, the drive sources combine to optimize both efficiency and performance. Above 130 km/h (80.78 mph), the three-cylinder engine becomes the main drive source but the EM 1 can support it if required. The 2+2-seater Audi crosslane coupé is 4.21 meters long (13.81 ft), 1.88 meters wide (6.17 ft) and 1.51 meters high (4.95 ft), with a wheelbase of 2.56 meters (8.40 ft). Its body design comes across as powerful and striking, and it already provides a foretaste of the design language of a future generation of Audi Q models. The single-frame grille, which is subdivided into several segments by struts, dominates the front end. Its prominent frame is integrated into the Multimaterial Space Frame as a supporting element. This solution symbolizes the philosophy behind the Audi crosslane coupé: a totally new fusion of basic concept, technology and design. 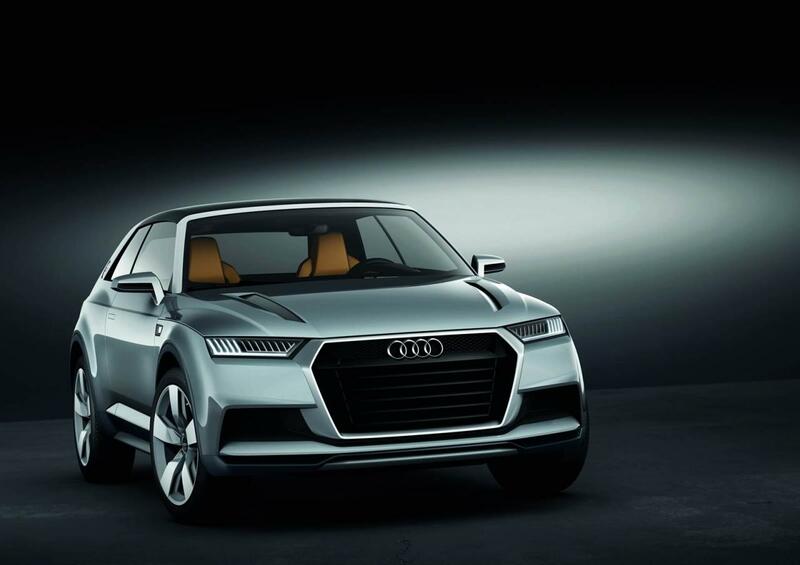 The trapezoidal headlights use Audi Matrix LED headlight technology. Small, individually controllable light-emitting diodes generate all lighting functions, and microreflectors enable their precise positioning. The bumper incorporates large, mainly smooth-surfaced air intakes. Through two narrow openings in the front lid it is possible to glimpse the upper aluminum members of the Multimaterial Space Frame. Along the sides, the horizontal edges are the dominant feature above the wheels. The low greenhouse tapers into a very flat C-post, emphasizing the coupé-like character of the Audi crosslane coupé. The doors extend a long way down thanks to the space frame design, which allows very low sills. The doors open to reveal the aluminum structures of the Multimaterial Space Frame. The tail lights are a variation on the motif of the headlights; the trunk lid seam divides them each into two segments. The bumper, the lower section of which is made from CFRP, incorporates an aluminum diffuser that extends quite some way up. The roof element comprises two CFRP shells and weighs slightly less than ten kilograms (22.05 lb). The driver and front passenger can unlatch it by an electric drive, remove it from the body structure and fit it over the trunk. The trunk forms a separate pan within the body structure; it is attached to the backs of the rear seats, which are separate from the seat cushions. At the press of a button, the entire unit travels about 40 cm (15.75 in) forward electrically; this is how the latched roof reaches its end position, in which it protects the luggage. At the same time, the level surface under the trunk becomes accessible, and it offers a flat storage space for dirty or wet objects. The driver and front passenger sit on electrically adjustable sport seats with integrated head restraints, the shells of which are made from CFRP. The center console integrates a large selector lever, which is electrically extended when the car is started; it is used to control the hybrid drive. The spokes of the steering wheel incorporate control surfaces for the thumbs, which the driver can use to carry out most functions. These can also be controlled just as intuitively from a large touchpad on the center console. The low dashboard is very clearly turned towards the driver. The air conditioning controls incorporate miniature displays. The virtual displays in the instrument cluster can be toggled between two different levels, and a powermeter visualizes the drive system’s operating statuses. The Audi crosslane coupé introduces new online services under the key word Audi connect. Its passengers are always connected to the Internet community – via Twitter, Facebook or by sending photos and videos recorded on the road. A completely new feature is the “Escape Manager” – a program passengers can use to review and comment on the routes they are driving for their friends. The interior design of the Audi crosslane coupé continues the design language of the exterior in the geometrical clarity of its basic shapes; instrument covers and the grilles on the air nozzles, for example, take up the trapezoidal theme. The narrow gap dimensions and three-dimensional surfaces reflect Audi’s uncompromisingly high quality standards. The dominant interior material of the Audi crosslane coupé is CFRP, which is used in a number of different variations. On the dashboard cowl, for instance, the composite fibers are all aligned in a single direction; this unidirectional arrangement is a new departure in the automotive sector. The CFRP parts are slightly lighter in color in some areas and darker in others, an effect achieved by different clear coat applications. The aluminum elements, too, are used in a subtly differentiated way. Most of them are machine-polished, but the air nozzles use a black anodized light alloy. The vehicle floor is made from glass fiber-reinforced polymer (GFRP) incorporating sections of a new material: Thick cords are woven with rubber threads to form a hard-wearing carpet. 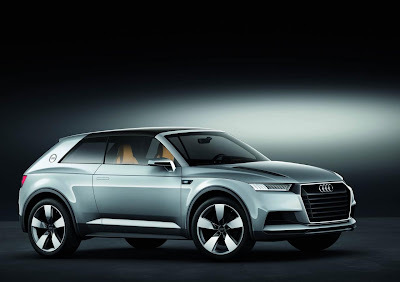 In their leather selections, Audi designers also employed various material grades. The most widely used grade is soft semi-aniline leather. Velvet leather in black provides an enlivening contrast. It has a robust, slightly coarse surface reminiscent of suede.